There were only brief moments when I saw the birds. Shards of clarity. The dew on the grass soaks my boots and the bottom two inches of my jeans before I reach the cliff top path. As usual I ignore the warning signs and start the climb towards the beach. There is enough light from the breaking dawn for me to see where I am going and besides, I know these cliffs like the back of my hand. This is a personal, well-worn, if unofficial route to nirvana. I disturb a Blackbird from one of the Hawthorns that just about manages to grow here. It flies off with an alarm call that is piercing in the morning quiet. Slung over my left shoulder is my telescope topped tripod and on my back is a camera bag filled not just with optics, breakfast is in there too. Binoculars swing around my neck as I work my way shorewards, bashing against my chest on the steep descent. In the pocket of my camouflage combat jacket are my notebook and pen. All I need. Well, nearly. I need some migratory shorebirds to complete the list of ingredients for this recipe. I find a suitable spot close to the toe of the cliffs and settle in for my breakfast, enjoying the sunrise, silence and solitude. Hot coffee from the flask and a couple of homemade muffins baked with leftover pick-your-own raspberries. I’m careful not to drop crumbs into the eyecups of my binos. Fast broken, I open the notebook at a fresh page, write the date, location and time across the top. Under the date I give a brief account of the weather. It is cloudless, the sky clear save for a pair of con trails from a jumbo jet heading north west. The air is cool, wind almost breathless. The tide builds momentum; I can see its leading edge down the estuary, just passing the golf course, rolling this way. Not long now. I take the final steps from the cliffs to the sand and pebble shore. Oystercatchers are noisy and I hear a Curlew call. Another answers. Redshank are piping excitedly, like they sense the water is coming. Their feeding becomes a little more earnest. I walk towards the marsh a little way, I get close to the point where the sand turns into mudflat and pause among the shells and seaweed of the strandline. The channel cut into the mudflats has filled and over spilled, the flood has begun. The sun shines. 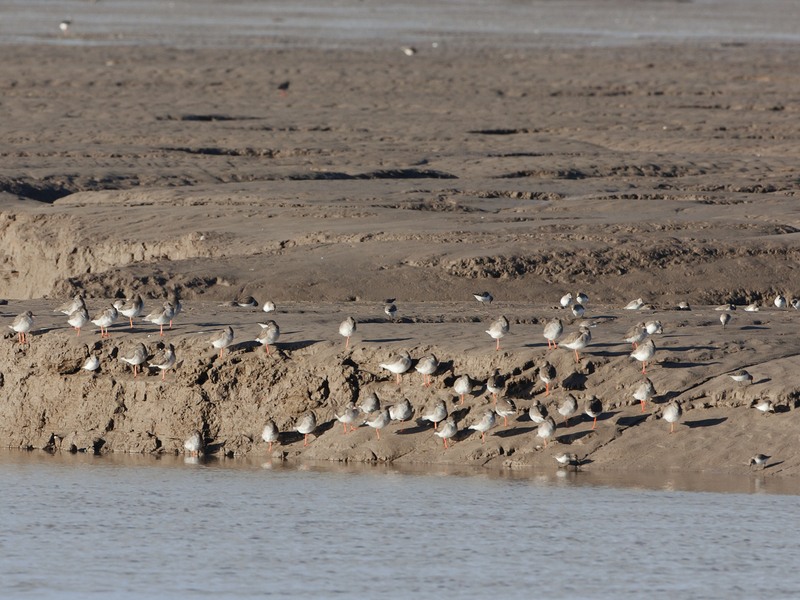 500 Blackwits stitch the mud at the edge of the tide. Pintail and Shelduck drift in behind them. I stop look, listen………………………. Blending into the shore. 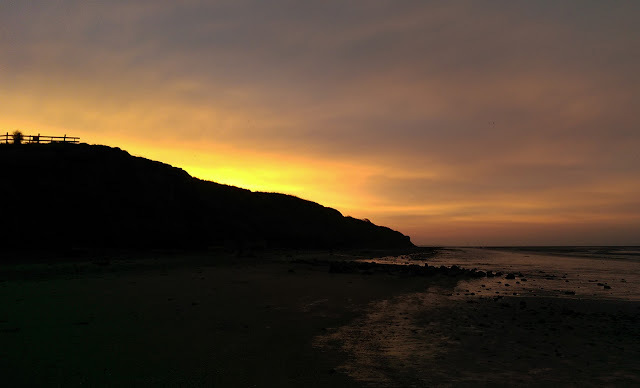 The sounds on the beach seem to be flowing from the mudflats to me - the bird’s calls, the spattering of bills and feet in super saturated gloopy mud and the gentle waves of the rising tide. All soft sounds building to a crescendo of white noise that would, if there was any other noise here, drown it out. The notes are flowing off the flats and into me via my toes as well as my ears. They start to fill me up. The sights are mesmeric. The frantic feeding of the birds, the gentle paddling of the Pintail and Shelduck. Tiny Teal, chestnut head, morning sun, irredescence. Splashes of mud, Dunlin scurrying. They all come to me through my eyes and my feet and my gut, filling me from the toes. When the sights and sounds reach my belly they turn to butterflies. Then my limbs start to ache in a pleasant way. Being pulled downwards, into the sand. The sights keep on. 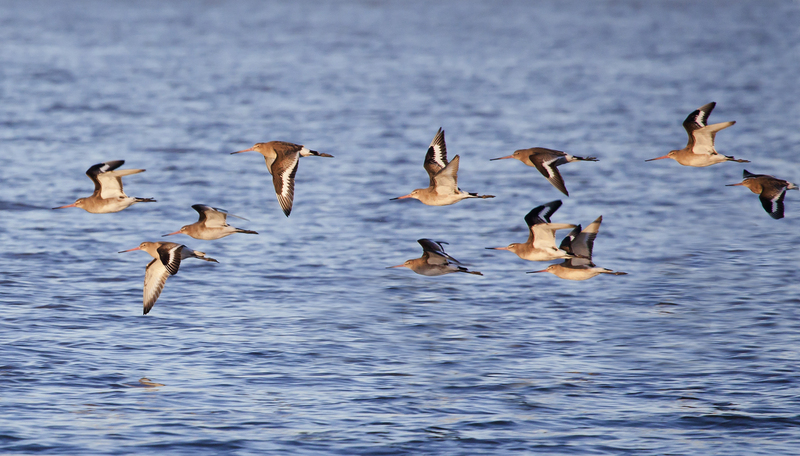 Blackwits in flight, morning sun, glowing bills. Redshank roosting, total peace, still. 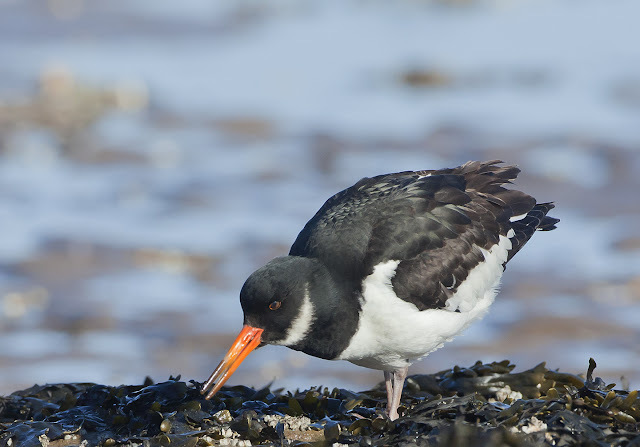 Oystercatcher feeding in slow motion, things starting to get sluggish, creep towards tidal height. Feeling blooms like algae, ink drops cloud in water, feel the diffusion – a slow-mo explosion of biological. Waders line up on the shore, Dunlin, Knot, Redshank, Curlew’s eye, Curlew’s bill, bubbles. The sights pile up in me, filling me, the sounds too, I am connected to the Patch, totally, not umbilically but close. I’m at capacity, but still it comes, I start to swell. 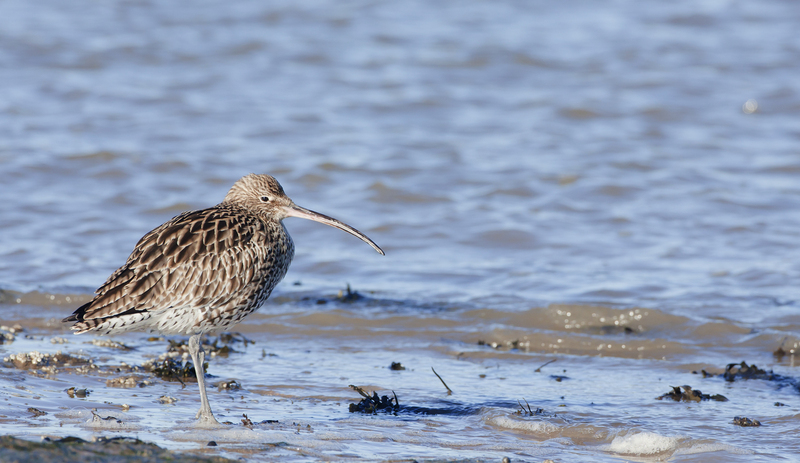 I grow, I’m ten feet tall on Curlew calls. 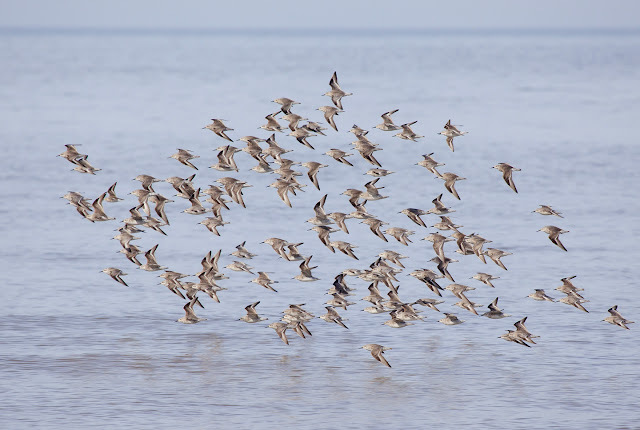 Knot in flight over rushing waves only two centimetres tall. Now I’m over the ground, held aloft by a stream of many golden strands flowing from the mud to my guts another explosion of slow motion, I catch sight of detail for a moment then it is gone, re-entranced. Birds fly in all directions, dispersed by the tide, I see them, but not fully, like I’m looking through a jam jar, it is all a little fuzzy except for shards of clarity where I see an Oystercatcher find a cockle. 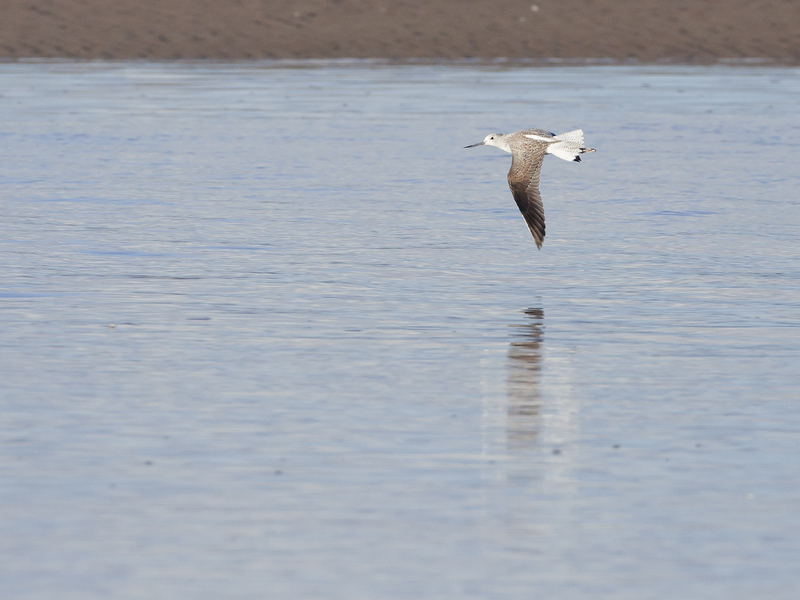 A Redshank run then fly, a Pintail tuck its head under wing, a boat swing on its anchor as the tide lifts it. Still in the air I am held by the river like a fly caught in amber. Slow motion. Mud, water, sea and sky. The tide nearing full height, waves catch the light. Crystals and the smell of vanilla and salt. All the Knot leave for the roost. They fly past in sharp focus. My stomach is burning with the feeling of it all, I watch, once removed, in an hour or in five minutes or both. 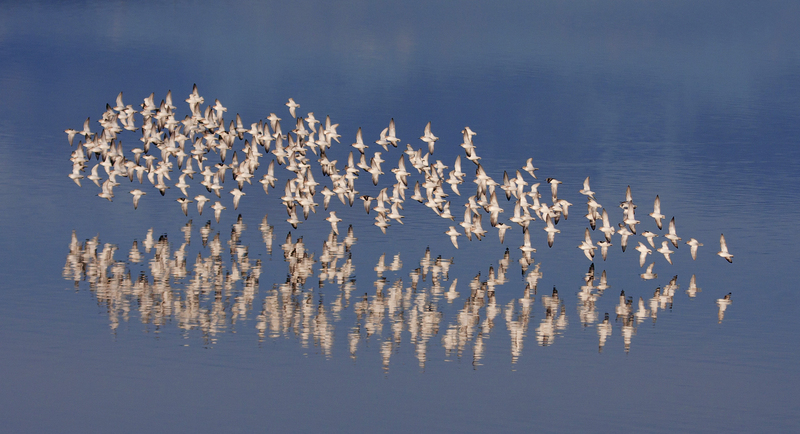 The Blackwits leave too. Limosa limosa, mud mud. Flesh and bone and feather. They are swept away, we are engulfed. 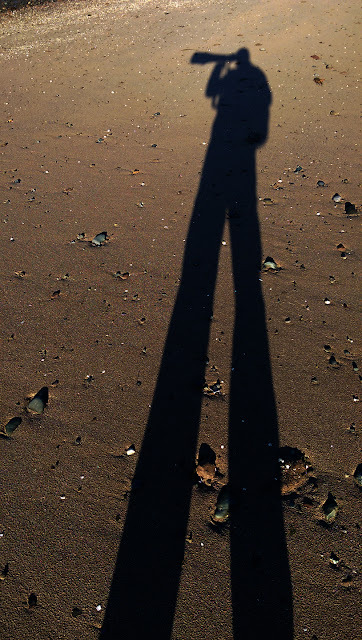 I am set down on the sand. I walk down the shore a little way, my steps have a matrass spring lightness and I feel like running home. Normally I would not run to catch a bus. I continue walking. A different type of calm returns. The flats are covered. Shelduck drift towards the marsh, everything else is already there. My experience was never out of body, those feelings were rooted in evolution by natural selection, a connection. The Patch is where I will raise my daughter and I should feel like this about it, it should be precious and transcendent and vital. No hallucinogens were involved. Just muffins, coffee (decaf), a few thousand birds, a few million gallons of mud and as much water all in beautiful dawn light. The tide, the pull of the moon. The pull of the Patch, its hooks in me, talon-esque. I look at the notebook, I have added nothing since the weather report. I decide to leave it blank. 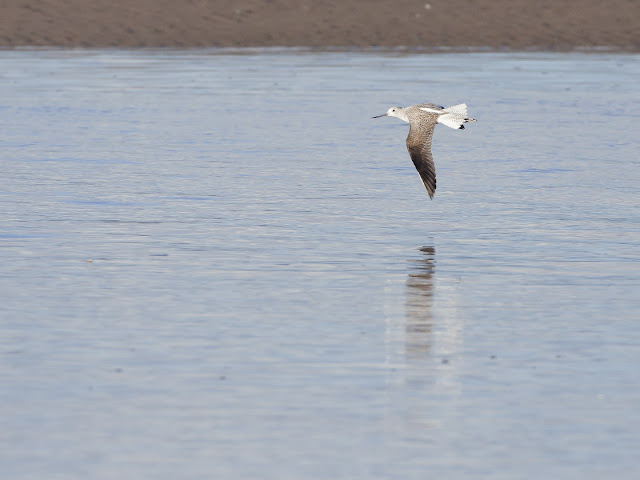 A hundred yards down the shore a Greenshank calls. I look up. It stretches its wings and flies off. I put my notebook away and walk home.